A few species appeared this week in the National Botanic Garden. Most notable of these was this Agaricus growing on the straw bales of the new maze. It appears to have been "demoted" from a species in it's own right to simply a variety of A. urinascens. Under the microscope the spores of the two species are identical, however the big difference is the smell. A. urinascens (as the name suggests) smells quite disgusting, whereas var. excellens has that slightly aniseedy smell typical of many Agaricus sp. As far as I can see there are no records for it here under either name, so a new Welsh record and a first for the Gardens. 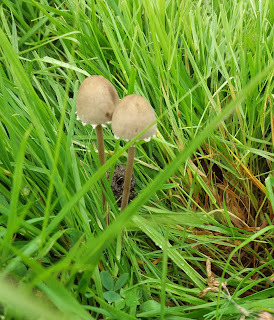 When I first saw these in the grass with the remains of the veil hanging off the cap and a stem which snapped as soon as I touched it, I thought they were going to be one of the Brittlestems (Psathyrella). They are in fact Mottlegills. It's easy to see how it got it's common name - The Petticoat Mottlegill - with the frilly edges to the cap. 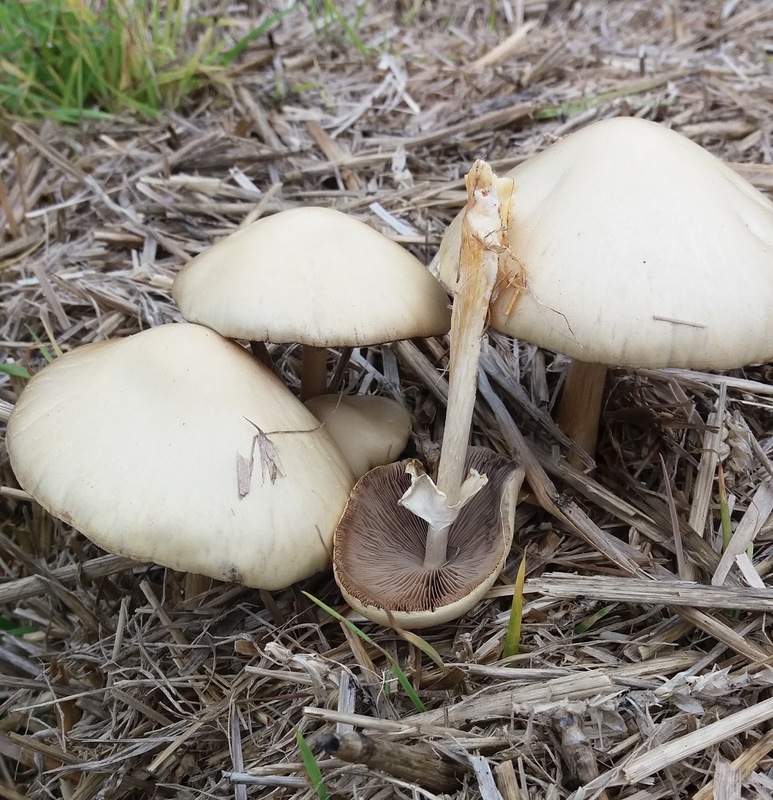 As the cap ages, these drop off making it far less easy to identify. What is less obvious is the Latin name. Someone must have had an extremely vivid imagination to think it in any way resembled a butterfly! Hygrocybe ceracea. 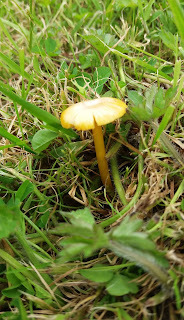 The Butter Waxcap. A couple of weeks ago the first of the Waxcaps appeared in the grass close to the Great Glasshouse. Now a second species - the Butter Waxcap has appeared in the Double Walled Garden. Great spots Tony. 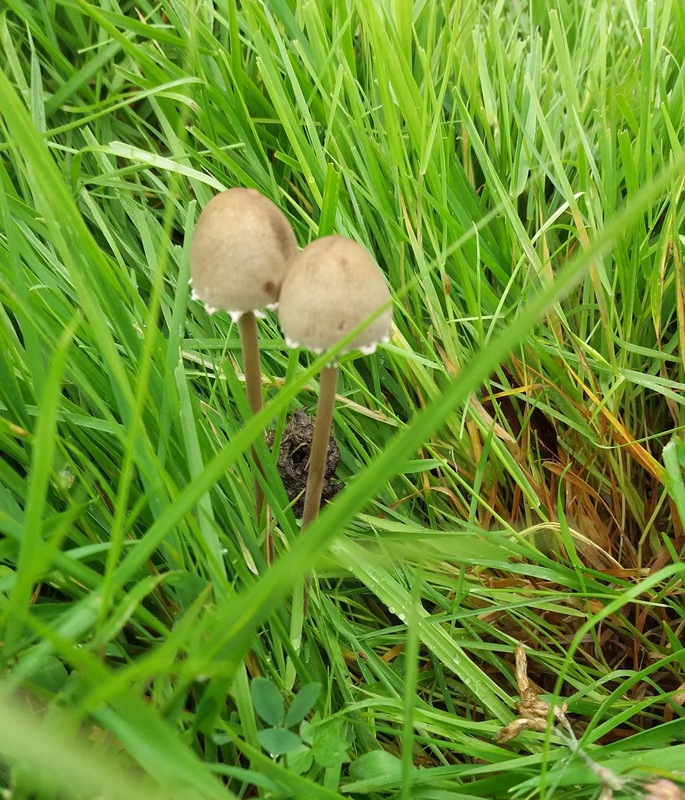 I don't think I've ever seen a waxcap in the Double Walled Garden and more obviously, we've never recorded Agaricus urinascens here before. Well spotted Tony. How many fungi records are there now for the Garden? I think that's one question for you Bruce. Only around 240 species have been formally recorded (no rusts on the list mind you). Over the next few months, I'm going to have a bit of concerted go at pulling together every known record for the Garden area so if anyone has a list they wish to share, please let me know. This list should be topping the 1000 mark I expect.